I don’t like touristy kitch souvenirs that you can find anywhere and are anyway not made in the country. I prefer to find authentic craft pieces that are not copies of the old ones but pieces that enhance the past and make it relevant in the present. So if you’re like me, your best bet in Jordan, is Silsal. They make beautiful pottery pieces (though they are currently extending the range towards a total lifestyle brand), either for every day use or just objects you can display because they are a work of art. After graduating from Santa Clara university, Mrs. Habayeb launched Silsal together with her sister 20 years ago. Sisal has earned a sterling reputation in Jordanian society, and has become the go-to gift shop for individuals, families, foreign embassies and corporations. 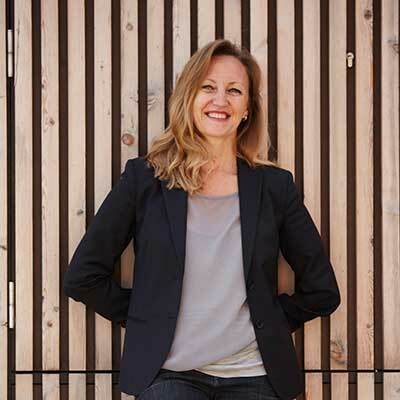 She is still the managing partner of the company although she handed over the reins to her daughter some years ago. Why did you start Silsal? My sister and I started Sisal 20 years ago. I majored in Political Sciences and my sister in Anthropology. And you know, when you graduate, you think you are going to reform the world. So we came back and wanted to do something using local material and local talents. Actually, my sister bought her first kiln with her marriage endowment: instead of buying furniture, she bought a kiln! And that’s how it started! 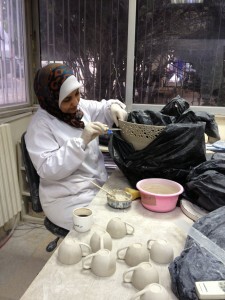 We were looking to empower Jordanian women artists, providing them with jobs and using local material. That was the project: produce locally, income generating, from the country and for the country. Now I’m talking 25 years ago, people from here did not appreciate art and ceramics and porcelain. Theypreferred silver and crystal and that was a major problem for us when we started. To give someone a gift of ceramics was something people did not appreciate. It was like “come on, you’re giving me clay?!”. So we had a very difficult time getting people to be interested in buying ceramics! Eventually, things changed and now I’m happy to say that they really look at it as a piece of art. But it took time. Yes, we sold only in Jordan. No, we have started to sell abroad. Then my daughter who studied ceramic design told us: “look, you wanted to develop a social project but I want to convert it into a business because this is actually not sustainable”. If we had been bread-earners for the family, this would not have been possible. Yes, that’s what I read in an article: that the company had not been making money for 18 years. So your first aim was social, right? So, now we are selling in Saudi Arabia, in the Gulf. Our pieces have been exhibited at the British Museum. And now, some pieces are available at the Louvre Museum shop in Paris: they ordered some pieces of the Islamic collection. Of course, this is very important for us. 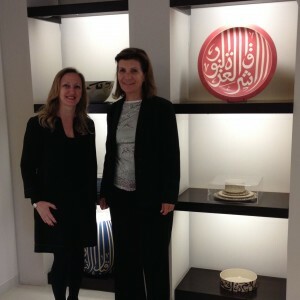 We are also mentioned in a “Leap of faith”, the book of Her Majesty Queen Noor: she mentions particular pieces she likes. So, it’s a nice feeling to see that our products are given as gifts everywhere and it’s nice to see that the business is being exported outside. It took 10/15 years for people to appreciate what we do but now they are proud that they can give something made in Jordan when they go abroad as official gifts. I wish I knew where our pieces were because many of our pieces are one of a kind. Some pieces we do and some pieces we don’t, the very difficult and very artistic ones, especially the hand-built ones. The pieces that are on the wheel are easy to replicate but not the hand-built ones. And the Jordanian taste is more classical whereas the hand-built pieces are, I don’t want to say fancy but more daring. So it takes a while for people to appreciate the “goût” of the modern pieces. Did the craftsmanship already exist in Jordan when you began or did you have to teach your workers? Did you make the pieces yourself at the beginning? We never did the wheel pieces ourselves. We did the hand-built pieces with clay. So besides the wheel, we did everything ourselves, first of all, because we had to master it ourselves and then also because we were short on staff. Yes, wheel and hand-building. We always had potters on the wheel. The good ones come from families of potters. It’s very interesting: if the father and the grand father were potters, then they excel in what they do. Most of our potters came from potters’families. They were potters already. And so we showed them what we liked and they did it: they brought the skill. The other artists all studied art: so they have the basic skills and the know-how. But every “atelier” in the world has its own specific way of designing. So you have to retrain, adjust. But the basic skills they had acquired as students and then they continue to develop them when working. When we have a new employee, they have to get used to our way of working. Then understand why and how we do this. Where are most of your artists from Jordan? Most of our staff is from Jordan. We’ve had occasionally people coming from Egypt and Iran but it’s mostly from Jordan because you’re not allowed to employ people from outside Jordan: you have to take a permission from the Ministry of Labour. It’s a hassle and they allow you only one or two. 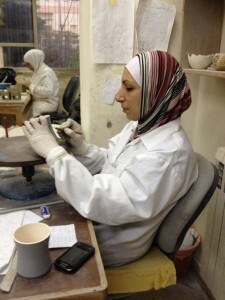 Is there a region in Jordan more skilled in pottery? Not really but now there are projects in Irak-al-Amirand Wadi Musa (Petra) where women are being trained: there are now “ateliers” for them to revive the skill in those areas. What they’re doing is still primitive but it’s OK.
Now, on the wheel, very often, Egyptians are shining in this area! I remember, in the past, the potters used to work on the streets by the side of the main road. They did their work there, firing and selling to passers-by. And then because of the pollution, the municipalities decided to close all the workshops on the streets. It’s understandable but, at the same time, it’s a pity because when they went inside, people couldn’t see their work and then their sales went down. The same happened with a beautiful workshop of Hebron glass and eventually it closed down. It’s sad because this is how you lose a craft. Are there other crafts that have died in Jordan? Do you mean Jo Bedu? Yes, Jo Bedu is another venture by the young generation. It’s fun; it’s nice; it’s saleable. It’s something to be proud of. There are similar young entrepreneurs who have started craft like this who export. No, my sister and I, are not managing anymore: we are advisers. My daughter is making the decisions. In a way, it’s good because we gave her the basics, the background and the know-how but the modus operandi of the younger generation is completely different and, I think, you have to give them the freedom to be able to do it their way. You can’t view the ocean if you want to keep sight of the shore! You have to let go because “entre les deux, mon coeur se balance” does not work! We are pleasantly surprised to see how fast she’s taking it to a different level. She’s been working with Silsal for seven years but she is now based in Dubai? Do you have shops in Dubai? No, not yet. We are working through agents. We don’t have a shop except in Jordan. Eventually, we will have but for the time being, we cannot mass-produce in Jordan. My daughter will tell you more about Silsal’s future strategy. You are also member of the Jordan Businesswomen Association. How is it like to be a businesswoman in Jordan. Was it difficult for you and your sister? In general, it’s not easy for a woman. In our business, we did not have problems because we were women. The only difficulties we faced at the beginning were when we had male employees who did not like the fact that they had female bosses. Now, it’s not an issue anymore. In general, it’s very difficult to start a business here because we have a lot of red tape. Besides this, as for every other start-up, it was very difficult at the beginning! There were days where nobody would come to the shop. One day, I remember, I even followed a tourist bus! Literally! We went through things like that. But you know, when you’re young, you do it! We had a lot of growing pains. It was a tough journey! My sister was doing the design and I was doing the management: we were a complementary team. It worked really well! And, I will show you the atelier but you have to know that pieces stay in a kiln for 3 days sometimes twice or three times, because it’s a process. And so, when the final result comes out of the kiln, after 3 days, it is so exciting and so rewarding. So we used to take all the pieces on the table, gather all the staff, administration and artists and we would discuss the pieces. The war between the commercial staff and the artists was amazing! The one would say “This is beautiful!” and then the other went “Yes but it does not sell!”… It’s a classic. But it was a fantastic spirit and atmosphere! It was the top of the journey. And also, when we started, a lot of the pieces were damaged: 20% of the production. So we had to work hard to bring it down to 3-4%. It was very rewarding. It gave a sense of family. A lot of women got married and had their children while working with us. It’s very nice to feel and see that you empower a family. How large is the staff now? On average, we have between 20 to 25 people working for us. And does everything happen on this site? Yes, it does. The workshop is in the house next door. When we bought this house (where the store is), we kept its architecture. It’s a house that was built in the 1950’s. Coming back to businesswomen in Jordan, are there dos and don’ts? No, the same rules apply everywhere. You will find nice men and you will find more chauvinistic ones. But Jordanian women have proved that they could run businesses. There are many businesswomen in Jordan: in small and large companies; we have many CEOs, in the banks, in the telecom business,… Of course the percentage of women in the workforce in Jordan is pretty low, only 14%, compared to Europe or even Saudi Arabia. Yes, but that’s because they have places that are specific for women: colleges, schools, hospitals where only women can work. But this is not the case in Jordan. The root of our problem is at school because the boys and girls are separated in public schools. And the boys are taught by male teachers and women are taught by female teachers. And because the profession of teaching is practised more by women than men, we tend to have better women teachers then men teachers. In the public schools, I think so. But then, lots of women don’t work after that because they choose not to, sometimes because of the family. It’s a cultural thing: the bread-earner is the man. He has to provide for the family. However, it’s changing: more and more men now accept that their wife works. Don’t you think that girls need role models like you to show that it is possible? 100%. It’s true that women have less confidence than men. But we shouldn’t. It’s interesting because, before starting Silsal, I taught for 5 years and children of working mothers definitely showed more independence and self-reliance. You could tell the difference. But, on the other hand, it’s not easy: women have to juggle and take care of the family, work, the children and they have a lot of hats they have to wear. Even if the husband is contributing, it’s not easy to juggle and they have that guilt feeling. And when I talk to younger ladies with children, I always tell them that they have to concentrate on quality time with their children: it’s not because you’re always there that you give them quality time. Actually, it’s the contrary because you get fed up! But, when you have young children, it’s not easy. I always admire women who manage to keep a career. I think we (women) are amazing! Does your Association of Businesswomen do something special to raise awareness among young girls? We have mentoring programmes but we should do more. Actually, it’s not with the Businesswomen Association but with the International Women’s Forum. Each year, we choose a sector and we’ve done it with 5 sectors up to now: judges, schools, IT, banks and nursing. And we take 20 to 25 women from the middle management. We give them leadership, empowerment and mentoring programmes. They attend workshops over the weekends for 4 months, every other weekend and then they have lectures at the end of the workshops. It covers human resources, communication, problem solving, creative development… It’s really amazing to see the effect on them. Any network between women, even if it’s just sitting, talking, complaining and comparing stories, is empowering because you learn. You are also the chairperson of SOS Orphanage, the children’s villages, can you explain what it is? It’s an amazing project that started after the Second World War with an Austrian philanthropist Hermann Gmeiner: he thought than instead of having orphans staying in institutions it was better to provide them with a family atmosphere, with brothers, sisters and a mother. So he started with a village of10 houses, each housing 6 to 9 children and a mother. The mother is a paid mother; she is a mother by profession. They are not her kids. She mustn’t be married and she mustn’t have biological kids because these kids become hers. She takes care of them, dresses them, brings them to school, cooks for them, takes care of the house,… And the children are orphans or abandoned children. There are now SOS villages in 133 countries in the world. We have 3 in Jordan: Amman, Irbid and Aqaba. We have a lot of challenges and the biggest one is sponsorship because we run on donations. But it’s also very rewarding to see that the kids have a mother they can love and that she loves them. The children are happy. We have a difficult time when the children are 14 and they have to move to the youth houses. That’s the system. Internationally, it’s the same everywhere and we are accountable to the Austrian organization that funds 50% of our needs. So yes, those transitions are tough; the same when they leave and find their own job. Is then the link broken between them and their “mother”? No, not at all! And that’s what’s beautiful about these SOS Villages. Every Friday (we call them “Village Fridays”), they come back and visit their mother. We have one of the mothers who now has 21 grandchildren! She’s retired but she comes back to the Village. It’s a nice atmosphere. We also have less successful stories but, in general, they are beautiful stories. I’ve been with SOS for over 15 years but, every 3 years, the longest serving board member has to leave completely and then they can come back again. So I’ve been on and off. It’s nice because then you have new blood. I love it. Yes, I see that you are passionate about it! Totally but you know education is my passion! I’ve served on the board of Queen Rania Teachers Award. Education: I love it! And this is a major challenge in Jordan. What are you the most proud of in your career? Sisal! I’m very proud of it. The fact that people, when they offer a gift from Jordan, they choose Silsal, it’s the most rewarding thing. And I love the family atmosphere we created here. I’d like to talk now about your city of Amman. How would you describe it to a foreigner who has never been here? Amman has grown a lot but has not lost its charm except for the traffic! I love to drive on Fridays and Saturdays! (because the streets are empty). When we were young, Amman was only 1st circle, 2nd circle and 3rd circle: that’s how far it went. Now you have 8 circles! People say one or 2 days are enough to see the city. But there is a lot to see. Drive around Amman and look at the architecture of the houses. It’s beautiful. Drive around the outskirts and see how the sun sets from different venues and every time, it’s different. Go and watch the sunset at the Citadel. My favourite place is the Nabad Gallery: the house is beautiful; the garden is beautiful and then the balcony that overlooks the Citadel… It’s charming. We have Dar-al-Anda, Darat Al-Funun. These are treasures that we have! Now Rainbow Street is a place where you can walk: we did not have that before. And everyday, there is something to do. It was not like that 20 years ago! You have activities, theaters (small but OK), movies, exhibitions, concerts,… If you look at the Jordan Times in the page “What’s on”, you’ll always find something to do. Public transport! That’s a no brainer! I feel very sad that it’s so under developed because it’s not fair for people who have to go to work. When you’re going downtown, the only way is to take a taxi because there is no way you can park there. Buses are crowded. They don’t go everywhere. It’s not feasible to keep on like that. It’s a big issue.